This month I’ve written a lot about how to achieve your goals in the coming year. I’ve discussed such things as creating business plans, branding, setting goals, and taking action. Today, in this last blog post of the year, I want to pull all of these concepts together. In fact, I want to give you one piece of advice that makes everything I teach you here on this blog all year long work. It will help you achieve success as a writer and in any endeavor. I believe if you follow this advice, it will help you succeed in life. Here’s the advice: Show up. To succeed as a writer or an author—or at anything you do in this world, you must show up. You can’t hide in the shadows or off at the corner of the stage, you must come into the light, take center stage. You have to be willing to share your message. Say what you believe. You have to do what you say you want to do. You have to show the world who you are and share your talents and gifts. Here’s another way to think about it: Unfold. As we grow up, we tend to fold ourselves up like a piece of paper. For many reasons, we become afraid to show the word all the facets of who we are. And so we fold and fold and fold until we become quite small and people can only see one or two sides of what makes up the greater whole of our true self. To succeed, we must unfold, unfold, unfold until the whole paper lies open for all to see. We have to return ourselves to our original form, pure and whole. Become large! Become all of who you are. That’s what people mean when they talk about authenticity. Be yourself. Allow others to see you—the real you. Don’t hide any of you. Let the real you come out in your writing, in your speaking and teaching, and in everything you do. Show up as that unique, divine creation that you are. Don’t let anything stop you from showing up. If you do, your success will be hindered. Playing small does not serve you. Play big. “We ask ourselves, who am I to be brilliant, talented, fabulous? “You are a child of God. Your playing small does not serve the World. There is nothing enlightened about shrinking so that other people won’t feel insecure around you. “We were born to make manifest the glory of God that is within us. It is not just in some of us; it is in everyone. As we let our own Light shine, we unconsciously give other people permission to do the same. I know this isn’t an easy task. I work daily at showing up, unfolding and playing big. Often I have to deal with my fear…all sorts of fear. As you move into the New Year, know I’m there with you…as are more people than you know. 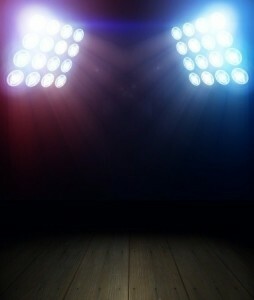 Take a step out onto the stage and let your light shine. Know, as Williamson said so well above, this is why you and I are here. We are supposed to fulfill our potential. We are supposed to realize our dreams. We are supposed to give to the world the talents and gifts we possess. We are supposed to show our greatness. And when you do this, you inspire others to do so as well. Then notice how you feel. Has he given you permission to show up and to play big? If so, tell me in a comment below how you plan to show up this coming year. 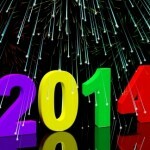 Have a fabulously successful New Year. Take advantage of my huge New Year Blow-Out Sale! I’m offering the lowest prices of the year on products and services to help writers and bloggers achieve their goals, including great deals on my Author of Change Transformational Coaching Program, which begins Jan. 6! Although I’m not setting specific resolutions, my theme this year is: Fear Not. Much of what you say here resonates with my theme– to unfold (love that), play big, write big, show up. That means living, exploring, writing– even if it’s crappy. Thanks for the boost to my heart today. Happy New Year.